This was a great smelling body lotion. It's so old that I don't even know if Victoria's Secret even sells it anymore. It's rare for me to not like a scent from Bath & Body Works but guys, this stuff smelled like feet! It was torture for me to finish it, but finish it I did! This is a great face scrub. It's really expensive though so I wouldn't purchase a full size. There's a few exoliators that I like more that are much more affordable. Although I only used this once, I could tell that I liked this face mask. It made my skin look brighter and feel cleaner. It's not my favorite mask, but it's definitely a good one. This is a great hydrating moisturizer. I used this a couple times after I used my GlamGlow mud masks. I'd consider buying this when I run out of my millions of other deep moisturizers. This was a good cleansing oil but nothing special. It did a good job at breaking up my makeup to be washed off. As with any cleansing oil, I always followed up with a real face cleanser. I wouldn't repurchase. I didn't like this eyeliner. It felt dry even when it was new, and actually I'm throwing it away because it recently dried up completely. This lip balm is fine. There's absolutely nothing special about it and there are much cheaper ones that are more moisturizing. This just feels like a wax on my lips. I wouldn't repurchase. I really like this lip balm. It does feel like it helps heal my dry lips. I'd purchase this. This was a decent hair serum and it tamed my frizz a little. Too much made my hair look really greasy though. There wasn't anything special about it and I wouldn't repurchase. This hair mask was just ok. I liked that it was very thick but my hair didn't feel THAT great after using it. Also, I think I'm the only one but I really don't like the fragrance of Living Proof products. To me they smell like Raid...yes, the bug spray. I like this deep conditioner. It's only a few bucks and it did a great job at making my hair feel more hydrated. I should never have even bought this because anything "weightless" won't work for my super dry hair. I need really thick conditioners. I had to use a ton of product just to be able to work this into my hair. It didn't make my hair feel softer or healthier at all. I wouldn't repurchase. This is a great hairspray and it's my holy grail. It doesn't not leave your hair "touchable". It holds styles wonderfully though and isn't that all we want our hairspray to do anyways? 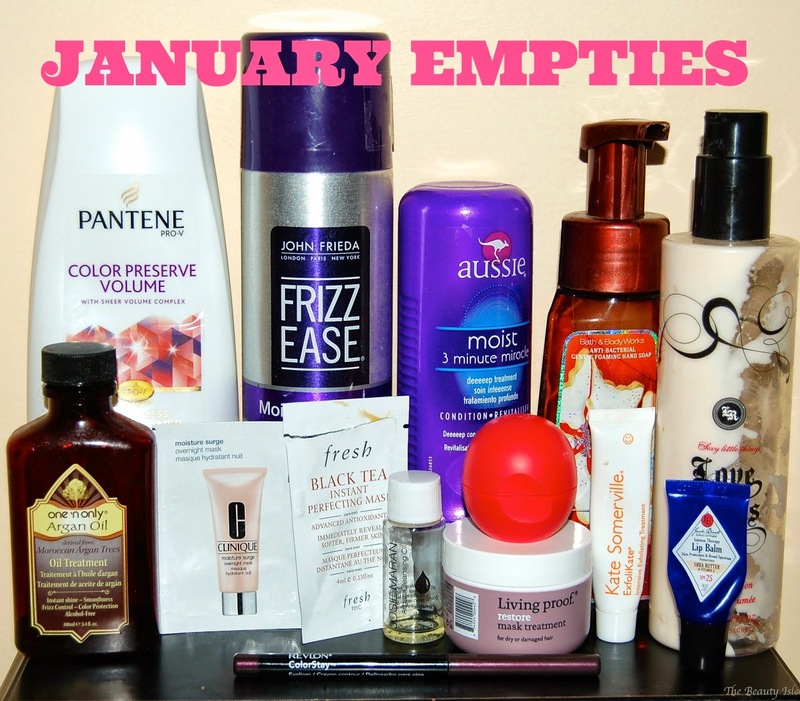 Well those are the beauty products I finished in January. As you can see I somehow went through a lot of hair products which is a strange coincidence. I can tell you right now that I'll be finishing up quite a few face cleansers for my February empties. Funny how that works. Have you tried any of these products? What are you thoughts on them?? As you've probably heard on the news, we've gotten pummeled with tons of snow. I'm so over it! I've had a very stressful beginning of the year but it seems like things are calming down...fingers crossed! I'm going to IMATS NYC! Who else is going? ?